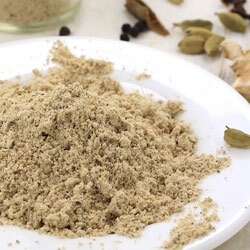 Garam Masala Powder (Curry Masala) is a spicy and flavorful Indian masala powder prepared using traditional Indian spices. It can be used as an ingredient in many gravies, curries and dals or as seasoning in many recipes. It is very easy to prepare it at home and can be stored for a long time. Take all the above ingredients except dried ginger powder in a heavy bottomed pan and roast for 2 minutes on medium flame. Cool them and grind them with dried ginger powder into a fine powder. Store it in an airtight container for up to 4 months. Keep it in a cool, dry and dark place. You can use it in all types of curries, dals and biryani for a spicy flavor. If you prepare curry or dal for 2 persons, then add 1 pinch garam masala in the last step of its preparation. Very nice masala recipe... spices used in this recipe are in perfect proportion. gives a nice spicy aroma and taste.